John Woo's critical and commercial failure Windtalkers (2002) isn't quite as bad as you remember, but it's by no means a good movie. 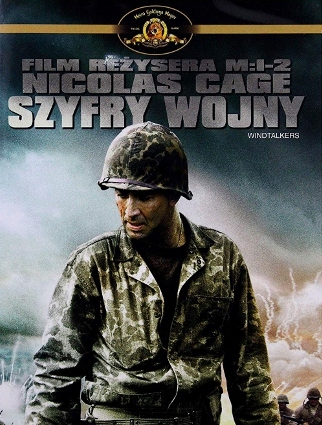 This WWII drama stars Nicholas Cage as Sergeant Joe Enders, whose most recent assignment is to protect Private Ben Yahzee (Adam Beach) from Japanese forces. Ben's importance? He's part of a select few Marines serving as Navajo code talkers, who are uniquely able to confuse the enemy by sending and receiving messages in their native tongue. Not surprisingly, it turns out that the code is more important that Ben's life: if he's in danger of being captured, Sergeant Joe has been ordered to kill him immediately. 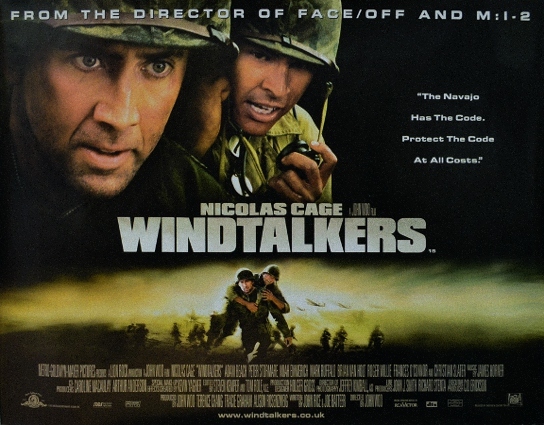 There's a lot going on during Windtalkers, but most of the film's energy seems focused on the wrong things. To its credit, the story has a lot of potential that's partially fulfilled by its lead actors: Nicholas Cage turns in a decent performance that's thankfully dialed way down from Face/Off and the like, Adam Beach is more impressive in a role that should've been the film's primary focus, and Christian Slater also shines as Sergeant Peter "Ox" Henderson, who's similarly tasked with protecting code talker Charlie Whitehorse (Roger Willie). The impressively staged action sequences, a Woo trademark, are visceral and effective in many areas but, as a whole, feel somewhat out of place in WWII territory, from the slow-motion squib bursts to at least one obligatory two-man Mexican stand-off. Had these strengths and faults been framed around a script that focused more on the Navajo perspective, I've no doubt the result would've been a lot more enjoyable and emotionally involving. As it is, Windtalkers feels like a hastily constructed action vehicle that doesn't justify a 134-minute running time: there's just not much of weight or genuine importance here, even though it ticks off a few boxes well enough and features a fairly deep cast of talented actors doing what they can with extremely limited material. Slightly more daunting is the 153-minute director's cut, first released in 2006 on DVD mere weeks after the launch of Blu-ray and HD DVD. Although the idea of fleshing out what seemed like an unfinished film may have yielded decent results, the differences here are negligible and, in some cases, only compound the film's existing problems. If you're interested in a substantially more detailed rundown of the differences between both cuts of Windtalkers (among other movies), this site is pretty much the only resource you'll ever need. Regardless of your favored cut, both die-hard fans of Windtalkers -- will be glad to know that MVD's two-disc Ultimate Edition serves up both options; MGM's Blu-ray, released later in 2006, only included the theatrical version. What's more is that a wide assortment of DVD-era bonus features has been carried over as well, which should theoretically make this a definitive package. Unfortunately, a few sloppy mistakes keep this from being a better release even if, by a slim margin, it's still the best home video version to date. Presented in its original 2.35:1 aspect ratio, Windtalkers (both the theatrical and director's cuts) arrives in two separate 1080p transfers on both discs and the results aren't always great. For starters, it's fairly obvious that these transfers were sourced from older masters (most likely the same ones used for both the 2006 Director's Cut DVD and Theatrical Cut Blu-ray), which were impressive more than a decade ago but obviously don't hold up to recent catalog restorations. Gamma levels are inconsistent with slightly washed-out blacks that rarely reach very deep, while overall image detail and textures are often a little lacking -- even in brightly-lit outdoor scenes, which should sparkle with clarity. The intentionally washed-out colors are well represented with no apparent bleeding (pun intended). Even so, there are some obvious bright spots here: film grain is largely left intact, the edge enhancement present on earlier DVD editions is nowhere to be found, and the bonus of finally having the director's cut in HD should please fans of that version. But this is far from "Ultimate Edition" treatment, as the slightly lacking visuals could have certainly used a bit more spit and polish. Equally disappointing is one aspect of this Blu-ray's audio: the director's cut, for whatever reason, is limited to Dolby Digital 5.1 instead of the full DTS-HD 5.1 Master Audio found on the theatrical cut. (What's more disappointing is the packaging makes no mention of this, as it advertises the lossless mix plus two Dolby 5.1 French and Spanish dubs.) Studios might have gotten away with this a decade ago, but it's practically inexcusable 12 years into the format's life. Moth the DTS-HD and Dolby mixes sound serviceable for what they are (clear dialogue, ample surround activity, strong music, etc. ), but if you own either previous release you won't find any improvements here. To add insult to injury, the included English subtitles feature several obvious typos, plus they duplicate the burned-in subtitles that pop up occasionally and often lag a full sentence behind what's being spoken on-screen. A very sloppy effort. MVD's interface offers simple navigation on both Blu-rays with access to chapter selection, audio/subtitle setup, and bonus features. This two-disc release arrives in a clear, dual-hubbed keepcase with one-sided artwork and a matching slipcover. Where MVD's Ultimate Edition shines is the bonus features: these all been ported over from MGM's 2003 Special Director's Edition DVD, most of which were also on the studio's 2006 Director's Cut DVD. These recycled extras include three separate Audio Commentaries (John Woo with producer Terence Chang, Christian Slater with Nicolas Cage, and actor Roger Willie with Navajo code talker consultant Albert Smith), a 23-minute "The Code Talkers - A Secret Code of Honor" featurette, a WWII tribute piece "American Heroes: A Tribute to Navajo Code Talkers", a short piece on The Music of Windtalkers", four Fly-on-the-Set Scene Diaries (23:27 total), a 15-minute "Actors Boot Camp" featurette, and the film's Trailer and TV Spot. Technically "new" to this release is a collection of Deleted Scenes; basically, it's the same 15-20 minutes of footage added in to the director's cut, so nothing most fans haven't seen before. MVD's new Ultimate Edition of John Woo's Windtalkers reminds me a lot of the recent Blu-ray release of Starchaser: The Legend of Orin: neither are great MGM movies, but both releases would have been more than passable if a better distributor handled them. The MVD package earns a few points for finally bringing the director's cut to Blu-ray -- and with all the extras to boot -- but also makes a few sloppy mistakes: the transfers look outdated, the director's cut only features Dolby Digital audio (which isn't even advertised on the packaging), and the English subtitles weren't even proofread. Due to only minor upgrades from MGM's 2006 Director's Cut DVD and Theatrical Cut Blu-ray (and I do mean minor), only the film's most rabid fans should bother with this one. Rent It.